Many political pundits have asked the question, “Why is Premier Doug Ford in such a hurry to pass Bill 5 / Bill 31 to reduce the size of Toronto City Council?” Few seem honest enough to provide the simple answer: Revenge and Ambition. Consider that Ford calculated that he was not going to beat John Tory in the next municipal election. Consider the possibility that the smear campaign against Patrick Brown was an inside job orchestrated by a far right team who calculated Ford had a better chance going into the Provincial leadership cauldron. Consider that Ford did not win the majority of votes in either the Progressive Conservative leadership debacle, nor in the provincial election. Yet, he is now PCPO Leader and Ontario’s Premier. Further consider that one of his first acts, after denying climate change and axing Ontario’s international carbon pricing agreement along with the green initiatives rebate plan, was to suspend the elections of Municipal Chairs in two Regions. Which two? Why that would be Peel Region, thus thwarting enemy Patrick Brown’s dreams of a comeback, and York Region, where former Liberal MPP rival Steven Del Duca was poised for victory. 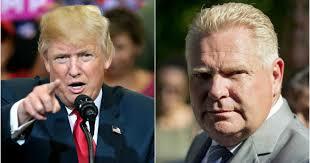 Not only are these two Regions among the GTA’s most populous and powerful, they are now under Ford’s baleful eye. The current scramble to cut Toronto City Council from 47 to 25 seats is a blatant move to allow Doug Ford to become Mayor of Toronto. If his cohort of lackeys led by Giorgio Mammolitti (who once compared Ford’s campaign to “religion”), Jim Karygiannis, and Stephen Holyday take the majority of the proposed 25 seats, the City of Toronto will be firmly under the management of Ford’s far right. With Boss Ford in control of Toronto, York Region and Peel Region, there is no telling what his regime could deconstruct. The solution to this problem, if Bill 5 or 31 become law and Toronto City Council is reduced to 25 seats, is not to vote for a single Ford acolyte. That may be the only way to stop this pompous populist from waging four years of war on social justice and environmental literacy. There are other ways, but we would need a Canadian hero like Louis Riel to lead the return to sanity. We could look south of our border for a cautionary tale if we need incentive. Both leaders are cut from the same playbook and both play to the lowest common denominator of the human condition. Ontario and Toronto deserve better.